On this expedition, we are trekking Sarek national park, one of the most remote part of Europe, without any marked trail or access by road. During six days, we travel through dense vegetation in the Rapa valley, across open tundra and through barren valleys with surrounding glaciers. We start our hike along the famous Kungsleden trail and finish by the Rapa delta where we climb Skierfe, a 700-meter cliff that dives down in the meandering Rapa river. The Sami people and their reindeers have traveled through those valleys for thousands of years and still do. The Rapa river, is an impressive meandering river and the fertile vegetation is a is a popular grazing area for the great Sarek moose. Sarek national park is part of the UNESCO world heritage site Laponia, protected for its unique combination of culture and nature. 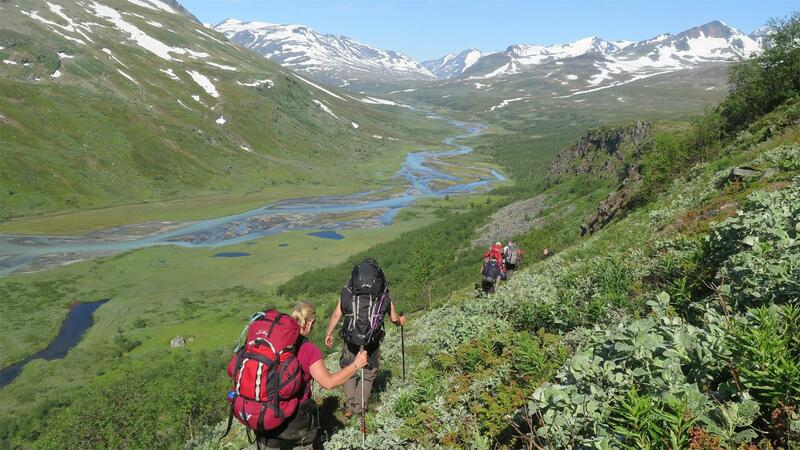 … likes challenges and wants to experience the remoteness of Sarek national park. You should be able to hike between 10-20 kilometer per day in terrain with moderate differences in altitude and with a backpack of around 15-20 kg. We will mostly follow game trails but also hike off-trail. Please contact us if you have any questions regarding your physical ability or experience level.